← Who tagged the Beaufort Sea polar bear with the tight collar? 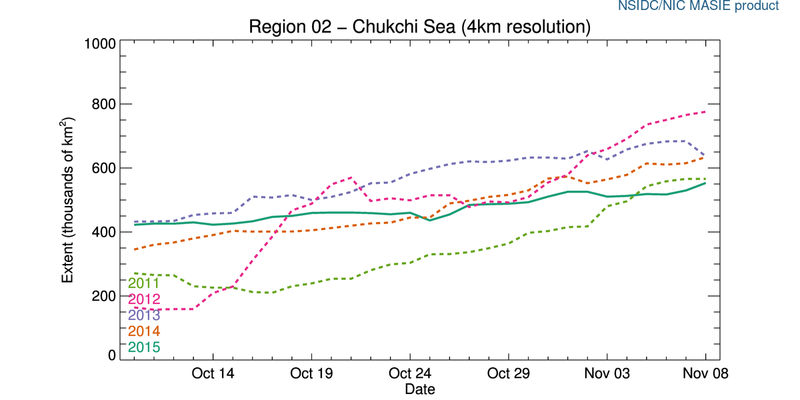 You may or may not have noticed that even though Chukchi Sea ice coverage has been way below average this melt season, there has been no hue-and-cry about poor suffering Chukchi polar bears. That’s because polar bear biologist’s own research has shown that the health and survival of these bears has not been negatively impacted by low summer sea ice. There may be threats from poaching in Russia, but not lack of summer sea ice. As of this date, developing sea ice is only just approaching Wrangel Island, a major polar bear denning region in the Chukchi Sea, see maps below (Ovsyanikov 2006). Yet, polar bear specialists insist that neighbouring Beaufort Sea bears – who endure a much shorter open-water season – are in peril of extinction because of scarce summer sea ice. 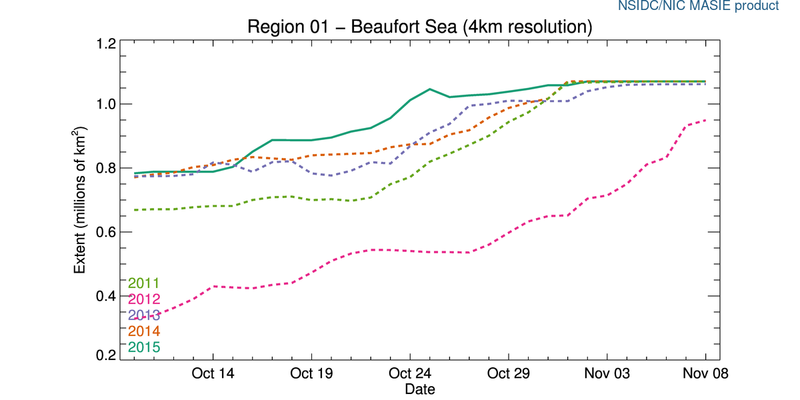 NSIDC’s Masie sea ice data graphs for Arctic regions (see below) show the Beaufort Sea is maxed out for ice coverage while Chukchi Sea is the lowest it has been in the last five years. 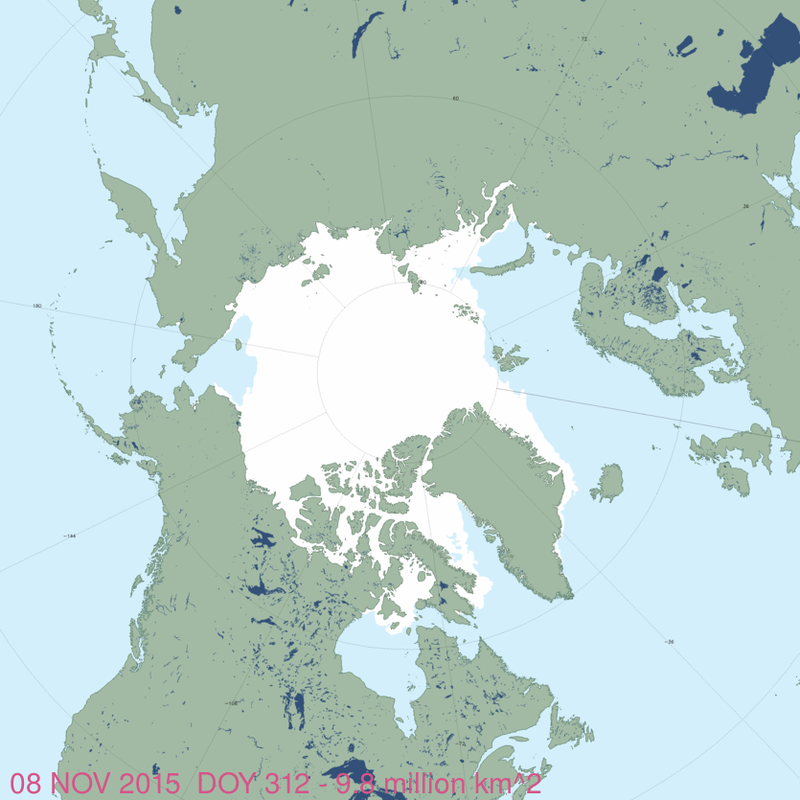 Here is how that sea ice looks on the landscape (as of 8 November 2015): the Beaufort Sea totally ice-covered, the Chukchi Sea still open water. Oddly, the agenda-driven “Circumpolar Action Plan” developed by polar bear specialists declares these two regions to be so similar in sea ice ecology that results from one can be used as a proxy the other in predictive models (Vongraven et al. 2012; Vongraven 2013). That Circumpolar Action Plan has now been accepted by all Arctic nations in a meeting of polar bear range states in September 2015 (documents here: pdf of final agreement; Q & A;“fact sheet”; meeting outcome document). Of course, the decision that the Chukchi Sea and the Beaufort Sea are ecological equivalents was made before research showed this was clearly not the case (Amstrup et al. 2007, 2011). Although the Chukchi Sea polar bear subpopulation has been deemed “data deficient” due to lack of recent population counts, recent research showed Chukchi bears were in excellent condition and reproducing well (good indicators of a thriving population) despite recent extended open-water seasons (Rode and Regehr 2010; Rode et al. 2013, 2014). But instead of admitting that the Arctic “ecoregions” concept was flawed, they made some vague excuses and carried on with the plan. Which means, henceforth, the Southern Beaufort polar bears that are known to suffer recurring bouts of starvation and population declines as a result of thick spring ice conditions every 10 years or so (Crockford 2015, summarized here) will get virtually all of the available research funds for annual surveys. Predictive models and management policies based on the the results will be applied to Chukchi Sea bears. Amstrup, S.C., Marcot, B.G., and Douglas, D.C. 2007. Forecasting the rangewide status of polar bears at selected times in the 21st century. Administrative Report. U.S. Geological Survey, Alaska Science Center, Anchorage, Alaska, USA. Ovsyanikov, N.G. 2006. Research and conservation of polar bears on Wrangel Island. pg. 167-171, in Aars, J., Lunn, N. J. and Derocher, A.E. (eds. ), Polar Bears: Proceedings of the 14th Working Meeting of the IUCN/SSC Polar Bear Specialist Group, 20-24 June 2005, Seattle, Washington, USA. Occasional Paper of the IUCN Species Survival Commission 32. IUCN, Gland (Switzerland) and Cambridge (UK). http://pbsg.npolar.no/en/meetings/ Pdf here. 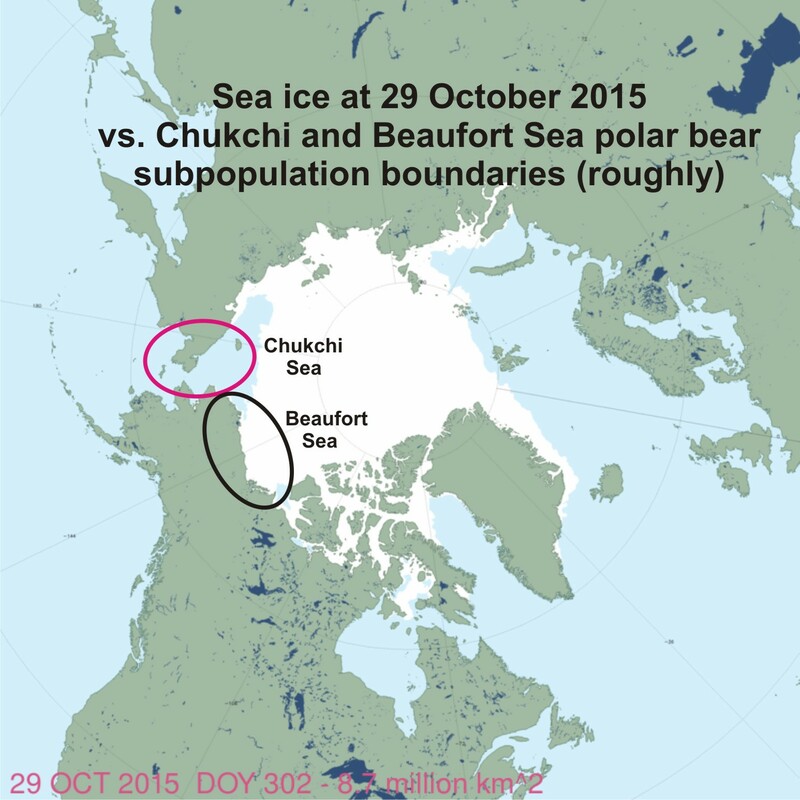 This entry was posted in Conservation Status, Sea ice habitat and tagged Beaufort Sea, Chukchi Sea, Circumpolar Action Plan, ecoregions, habitat, polar bear, sea ice, summer sea ice, Wrangel Island. Bookmark the permalink.